I enjoy sharing with you the unique foods of southern Louisiana and the traditions that go with them. Although many Cajun delicacies are well known today, there are still a few that people have never heard of. One of these is a cured ham called Tasso. I recently introduced this smoky meat to the favored homemade dish of macaroni and cheese. The spicy-sweet flavor adds a bit more satisfaction to this yummy comfort food. Tasso gets its origin from the days of the Boucheries. (That’s a hog-killin’ in case you need an interpretation.) This smoked meat was made from the last of the butchering, the leftover strips of pork. Today, it’s more like a heavily seasoned smoked ham found in specialty meat stores and some grocery stores across Acadiana. Boucherie’s were a common event during a time when most people raised and processed their own food. My mama said it was hard work that would begin on an early cool, dry fall or winter day. She recalls the process of killing, bathing, boiling, shaving and lastly gutting the animal. Then began the making of boudin, cracklins, sausage and a pork stew to feed the hungry laborers. Nothing was wasted from the Boucherie. The tail was added to the stew while the head was for making hog head cheese and someone always brought the feet home for I don’t know what! In some areas, this community effort also included feasting sometimes with live music and dancing at the end of the long day. Thus the term La Boucherie (the butchering) came about. It was a shared work of the necessities of life that included a celebration making a part of their everyday life not so ordinary. Today, in south Louisiana there are Boucherie Festivals held to honor that same communal tradition. I remember times when daddy would come home after a full day of working and hauling cattle. He’d walk in the house carrying a package wrapped in butcher’s paper and begin slicing pieces from its contents to share with us. The smell of the smoked meat told us that it was fresh Tasso or “Cowboy Food” as he called it. We aren’t exactly sure where he got this saddle bag food from, but mama said it was probably given to him by someone he’d been working with. Tasso didn’t often make it into mama’s dishes the way a lot of Cajuns add it to their vegetables, gumbos, and jambalayas. We would eat it as soon as Daddy would slice it up. Not being able to get it just anywhere made it such a treat. Its availability is the same today so when a friend told me that the best Tasso is sold in Eunice, Louisiana I just had to see for myself. So off we went. Eunice is located about 20 miles north of Crowley and the hour drive from my mama’s house was well worth it. LeJeune’s Sausage Kitchen is a quaint store that is easy to get to with a quick exit off of LA Highway 13. It is family owned with mama and son working behind the counter taking customer’s orders and checking them out. As we were snapping pictures of their building on our way back to our car, their son invited us for a sneak peek into the smokehouse and refrigerated buildings. It was quite a sight. There seemed to be cars coming and going while we were at this little store. I found it odd how they attract so much business with it’s off the main road location selling only 3 items: Tasso, smoked sausage, and stuffed Chaudin. After sampling the Tasso, I understood why. The spicy-sweet seasoning and heavily smoked taste make it worth seeking out this little neighborhood store. Smoked sausage hanging from the smokehouse ceiling. Troughs full of smoldering wood is used to smoke the meat. 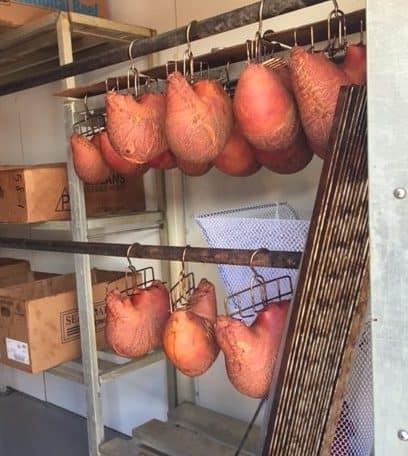 The Tasso is hung out above the sausage in a refrigerated building before packaging. Stuffed Chaudin is stored by hanging in another one of their refrigerated houses. Chaudin is the lining of the pork’s stomach, stuffed with sausage and served similar to a roast. Before you go judging, there are other cultures that consume this same animal organ such as the Scotts who prefer to stuff the stomachs of their sheep. Bah! And having said all that I want to present to you my Tasso Macaroni and Cheese. Tada! I ate something similar to this in a Little Rock restaurant this summer. It was a delightful creamy plate full of mac and cheese with a hint of onion and sun-dried tomatoes with ham. It was delicious, but I thought that Tasso would make it even better and it did. Now, if you cannot get your hands on some Tasso don’t let that stop you from making this delicious recipe of pure comfort food. It’s still delicious made with ham. That is until you can get yourself down south and discover that Cajun delicacy called Tasso. Here is a picture of the Tasso and other ingredients for the macaroni and cheese. The Mexican Four Cheese has a little cream cheese which adds more creaminess to the sauce. First, you make a roux for the sauce then add the cream. The last ingredients are Tasso and macaroni before pouring into a casserole dish and topping with the breadcrumb mixture. A creamy macaroni and cheese dish seasoned with Cajun seasoning, chives and sun-dried tomatoes with a flavorful burst of Cajun Tasso ham. The blend of flavors takes comfort food to the next level of satisfaction! Preheat oven to 400 degrees. Grease a casserole dish. In a large pot, cook macaroni in salted boiling water for 7 minutes. Drain and set aside. In a large heavy pot melt butter and add flour stirring to cook for 1 minute. Stir in chives and tomatoes. Pour milk and cream into roux mixture stirring with a whisk at first. Continue stirring until it comes to a boil and let cook for a few minutes longer in order to thicken the sauce. Add cheese a cup at a time in order to melt and blend well into the sauce. Stir in the macaroni, seasoning, and ham into the cheese sauce, mixing well before pouring into the greased casserole dish. Mix bread crumbs, chives, and parmesan cheese together in a small bowl. Top the macaroni and cheese with the bread crumb mixture in the casserole dish. Bake for 18-20 minutes in the preheated oven. Let cool for a few minutes before serving. There are only 3 ingredients for the topping, breadcrumbs, chives, and cheese. Tags: Beef Tasso, Cheese Sauce, La Boucherie, Macaroni and Cheese with Meet, Meet Macaroni and Cheese, Smoked Meet, Smoky Macaroni and Cheese, Tasso, Tasso Macaroni and Cheese, The Boucherie, What is a Boucherie? Probably not! It’s a dish worth celebrating with. Loooks yummy! I’m gonna try this!